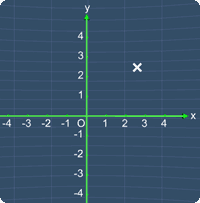 This page contains lessons on the Cartesian Plane (Coordinate Plane). Here, you can learn about the plane, how to plot points on the plane and more. Each lesson consists of a math video, study tips and practice questions. The lessons below will introduce to you the coordinate plane and will show you how to plot points on the plane. Note that, these are the basics needed before you can graph and analyze equations.